LA QUINTA, Calif. -- Men's pro golf in the Coachella Valley has proven a fickle beast. The vast history of what's now the Humana Challenge (still better known as the "Bob Hope") stretches back to a genesis tournament in the early 1950s. Over six decades of play, the list of courses used to host various incarnations of the event tallies a dozen in number. SilverRock Resort offers one of the area's most inspired and demanding canvasses of golf. SilverRock Resort is the city of La Quinta's first municipal golf course. This Arnold Palmer Classic Course is the home course of the Bob Hope Classic. At 7,578 yards, it is the longest course in Palm Springs and one of the longest courses on the PGA Tour. When the Humana pared down to a rotation of three courses (and four days) in 2012, the latest track to become a "former" PGA Tour course was the Arnold Palmer-designed SilverRock Resort. Myriad Tour pros (whether privately or on record) were disappointed to hear of the track's exclusion, the most notable of which was 2011 Hope runner-up Gary Woodland who declined to play in the '12 event specifically due to SilverRock's removal. But like resilient desert foliage, SilverRock plays on -- and continues doing so in a big way. "I think the changes to the tournament and the new format were good," said SilverRock Head Professional James Saenz. "There was some disappointment to not being in the new format, but we completely understand why they made the changes they did. But overall, having our facility open that week was probably far more beneficial to us fiscally. We had a ton of play that week." If you are placing tee into turf, remember SilverRock offers one of the area's most inspired and demanding canvasses of golf. And at nearly 7,600 yards from the tips, it's also one of the longest in Southern California. One cannot survive at SilverRock on distance alone. Though the landing areas are often generous, the first-timer will experience some nuance off the tee. While 10 holes chart at 418 yards or better, a solid drive still requires study. Of the 200 acres of golf property, a quarter of the land is sculpted around native areas. Translation: Examine the modern GPS mapping well. Finding the fairway at SilverRock doesn't segue to easy scoring chances. Every green is armed with protection, and those playing bailouts will oft-encounter a thick second-cut or a potentially penal chip sporting danger across the green. "Even the greens that don't seem to be guarded probably are," said Sanez. "All the greens have some sort of bunkering around them -- or a lake. When people ask for advice, the main thing I tell them is to club-up. You can play the golf course past the green, but it's really difficult short of the green because of the swales and the bunkering." Adding to the call for learned distance and demand for accuracy is the canal running through the back side. "The length, especially on the back, is a defining feature. That's where the challenge begins," Saenz said. "The par 5 on No. 12 is a good example of all of it. It's a tough lay-up. If you start cheating to the right, you can go into the canal, which runs diagonally across. And the more you try to cut off to the left, you can go right into the lake." As SilverRock winds you home against the base of the Santa Rosa Mountains, the finishing holes serve as a mental test to see if the learned player has taken notes about clubbing long. "On No. 16, there's an area behind the green where if you roll past or you're long, it's much easier," Sanez said of the 488-yard par 4. "And on the par-3 17th, there's the lake in front, but if you play long, there's a lot of grass back there that will catch your ball. The hole can also play into the wind. I found that putting the hybrid in my bag makes that one a little easier to play." The 570-yard, par-5 18th proves an excellent finishing hole with the canal running through the deep fairway, coupled with water to the front left of the green and bunkering to all sides of the putting surface. It's as if The King crafted one last court to provide the player a worthy crown -- or jester's cap. "I thought the course was great, really beautiful," said Bob Perkins of Seattle. "It was in great shape and with lots of sand to deal with. We've played a few other courses out here, but this has been the prettiest." 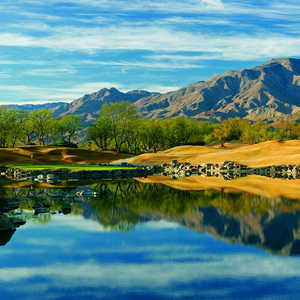 Many visitors to the Palm Springs area slate their golf getaway with tee times across the desert. But SilverRock is a course you'll want to play twice. With added course knowledge, the track will play far more favorably, and the brilliant surrounds will prove all the more rewarding. Full practice facility is offered, and on-site instruction is available to players of all levels. Tip: Arrive early and make use of the practice bunkering.